In this corner is tall, red-haired art historian Sweeney St. George, an expert on Victorian death rituals and representations; in that corner are a burglar, a blackmailer, a murderer or two, and Sweeney’s romantic rival for the attentions of Toby DiMarco, the longstanding chum who invited her to spend the Christmas break with his relatives at Byzantium, a former artists’ colony in Vermont, where she becomes obsessed with discovering who carved Mary Denholm’s atypical 1890 tombstone. Sweeney’s attempts to pinpoint the sculptor are stymied when Ruth Kimball, a descendant of Mary’s who promised her information, is murdered in the cemetery, and old Byzantium artist journals kept in the historical society turn out to have crucial pages missing. Though everyone duly expresses regret that someone has clipped Sweeney’s emerald earrings and a few minor portraits from Byzantium’s most productive period, the colony’s current residents are not exactly devastated by the demise of old Mrs. Kimball, who wanted to sell her property to a condo developer. There’ll be another fatality and more burglaries as Sweeney and Ian, a visiting Englishman, scrutinize Tennyson tombstone verses for clues and Rosemary, whose facial birthmark can’t hide her dangerous beauty, puts the moves on Toby. 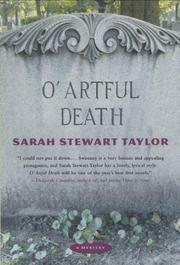 Taylor’s debut offers pithy assessments of the Pre-Raphaelites, Tennyson, and Victorian mores, along with Christmas-card pretty scenes of winter in Vermont.